Requesting time off indicates to the members of your company responsible for scheduling customer appointments that you do not wish to be scheduled during certain time periods. Time off requests can be a one time request (i.e Monday, December 8 from 10:00AM to 2:00PM) or a recurring weekly request (i.e Every Monday/Wednesday/Friday from 10:00AM to 2:00PM). Recurring time off requests can be cancelled for individual days. For example, if you have a recurring time off request for every Tuesday from 2-6pm, you might decide that you want to work one of those Tuesdays. See deleting time off requests. Using the sidebar navigation select “My Schedule”. Click the button labelled “Add Time Off”. For “How?” select “Occurs Once”. 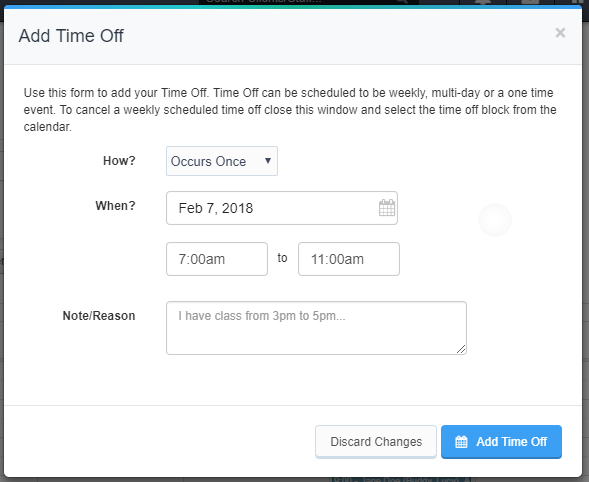 Select the date and time you wish the time off request to be scheduled and optionally add a note/reason for your time off. When ready, click the button labelled “Add Time Off” to save your request. For “How?” select “Multi Day”. 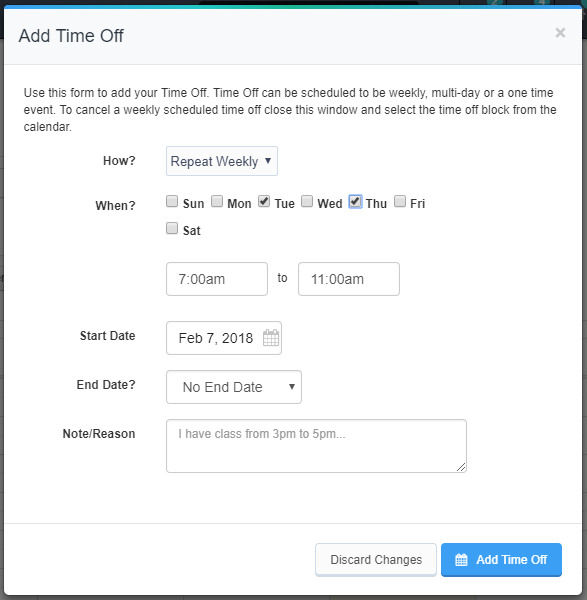 Select the dates you wish the time off request to be scheduled and optionally add a note/reason for your time off. For “How?” select “Repeat Weekly”. Select the days of the week and time of day you wish this request to occur on. 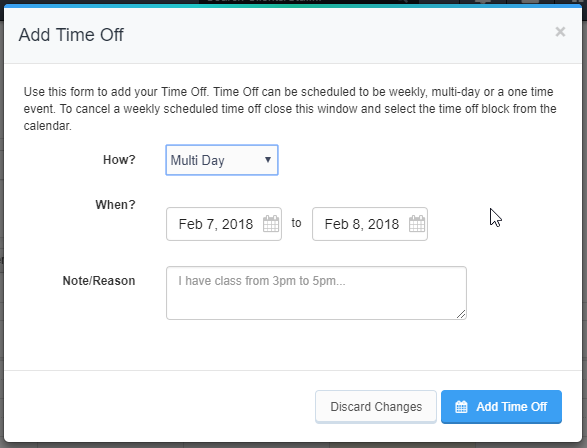 Select a start date for your recurring time off and optionally select an end date and add a note/reason for your time off. A single time off request. A multi day time off request. A weekly time off request. Click on the time off request. If this was a single or multi day time off request, the following window will appear. 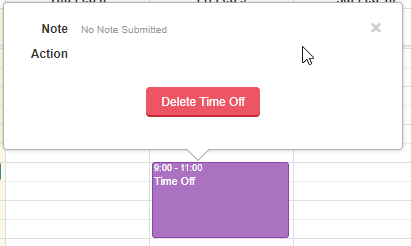 Click “Delete Time Off” to proceed with removing the time off. If this was a recurring time off request, the following window will appear. 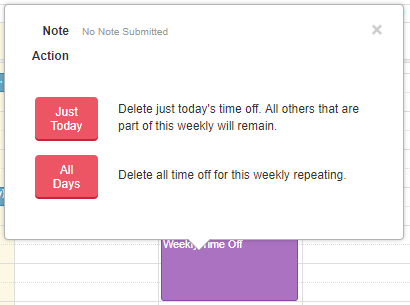 Choose “Just Today” to remove just that day’s request or “All Days” to completely remove the recurring time off request.